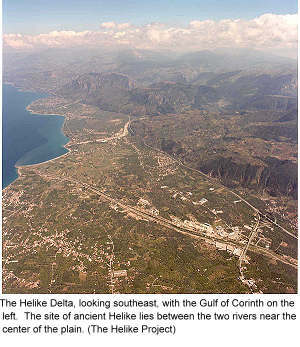 In the summer of 2001, a scientific team directed by Dora Katsonopoulou and Steven Soter discovered the first traces of the Classical Greek city of Helike, destroyed and submerged by an earthquake and tsunami in 373 BC. They also discovered its prehistoric predecessor, an entire Early Bronze Age town, previously unsuspected, and evidently submerged in the same coastal plain some two thousand years earlier. In the summer of 2003, the Helike Project to continued its excavation of the Early Bronze Age site. At a depth of 5 meters, the team then discovered a remarkably well-preserved corridor house, with rooms containing dozens of complete pots, bone tools, spindle whorls, animal bones and seashells. Some vases contained organic contents, including seeds. In order to help protect the Classical and Early Bronze Age sites from destruction by a new railroad that would run over them, the World Monuments Fund has included Helike in its List of 100 Most Endangered Sites for 2004, 2005 and 2006. John Noble Wilford (2003). Scientists Unearth Urban Center More Ancient Than Plato. New York Times, 2 December 2003.